Hometown: Hamilton, New Jersey, U.S.
Died: April 22, 2011 in Numaniyah, Iraq supporting Operation New Dawn. Unit: Army, Fox Troop, 2nd Squadron, 3rd Armored Cavalry Regt. from Fort Hood, TX. 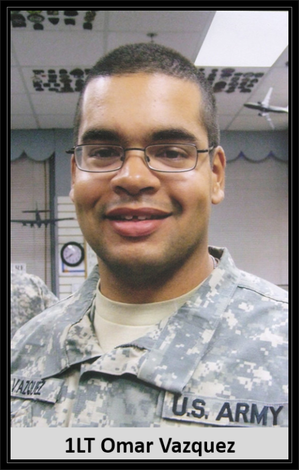 1st Lt. Omar J. Vazquez, 25, of Hamilton, N.J. died of wounds suffered April 22, in Numaniyah, Iraq when insurgents attacked their unit with an improvised explosive device. 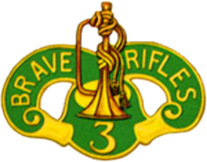 They were assigned to the 2nd Squadron, 3rd Armored Cavalry Regiment, Fort Hood, Texas. HAMILTON — When he was a boy, his favorite toy was a G.I. Joe action figure. And when Halloween came around, he’d usually dress the part of a U.S. Army soldier. But when the Sept. 11, 2001 attacks of the United States occurred, Omar Vazquez knew his noble, childhood dreams of serving his country would need to become a serious reality. And on Friday morning, he paid the ultimate price for his lifetime commitment. Vazquez, an Army lieutenant from Hamilton, was one of two U.S. service members killed during a mission in southern Iraq, family and friends confirmed to The Star-Ledger today. He served Operation New Dawn with Fox Troop, 2nd Squadron in the 3rd Armored Cavalry Regiment based at Ford Hood, Texas. He was 25. 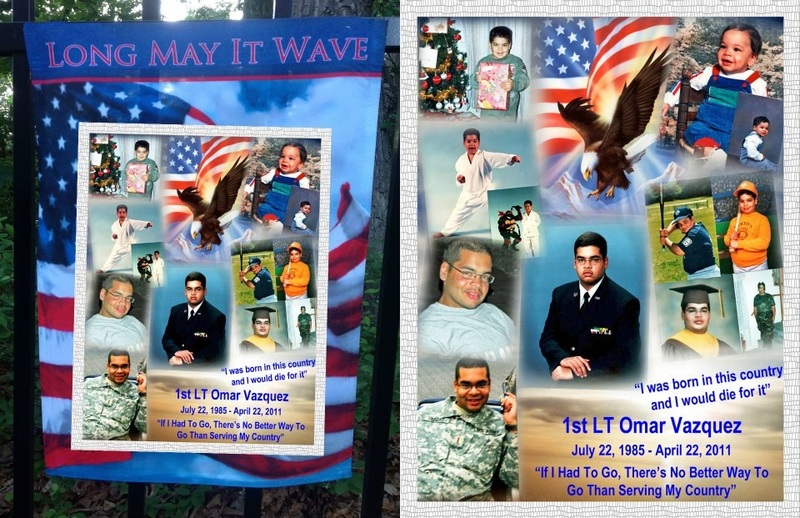 "He was such a great man and always wanted to fight for his country," said Marisel Vazquez, Omar’s sister. "He was so proud to be in the Army." Sitting in her son’s bedroom with pictures of him on the bed and in picture frames, Maria Vazquez cried today as she recalled the last time she saw her son. "He came home at Christmas and stayed here a week," she said. "Since Sept. 11, he’s been saying he wanted to join the military and defend the country." Vazquez is the 99th person with ties to New Jersey to die in Iraq since the 2003, U.S.-led invasion to oust Saddam Hussein. Earlier this month, U.S. Army Sgt. Keith Buzinski, a Hamilton native, was killed by insurgents in Afghanistan. At least 31 other service members with ties to the state have died in Afghanistan. Vazquez, the youngest of four children, was known for his intellect as much as his leadership skills. He graduated from McCorristin Catholic High School, now Trenton Catholic Academy, in 2003. After earning an associate degree at Mercer County Community College, Vazquez graduated from Rider University with a bachelor’s degree in history in 2007 and earned a master’s in liberal studies from Rutgers-Camden in 2009. Joseph Gowaskie, a veteran of the Vietnam War and history professor at Rider who had Vazquez as a student, said he was "distraught" over the loss of a brilliant mind. "We talked about some of the dangers of being in the military," Gowaskie said. "But he said this is what he wanted to do." Despite his studies and a great passion for books on U.S. and world history, Vazquez’s dedication to service was top priority, according to family and friends. He joined a local ROTC program at age 11. In 2009, he served at a Leader’s Training Course at Fort Knox, Ky. to assist new ROTC cadets before being stationed at Fort Hood as a field artillery officer. Overcoming asthma, he was finally deployed for his first tour of Iraq, stationed in Al Kut, last August. 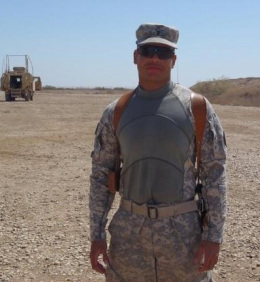 John Rindt, one of Vazquez’s best friends in high school and currently serving in the U.S. Army as a flight medic in Iraq, said Vazquez’s passion was to be in the Army. "He died doing what he loved," Rindt said. "He had no fear to enlist in the service and accomplishing what he set up to do." George Hrico, a next-door neighbor of Vazquez when they both lived in Trenton as youths, recalled how his "best friend and brother" had protective and leadership qualities from an early age. Hrico recalls being fearful of being beaten up by a group of neighborhood bullies while conducting his paper route. But Vazquez calmed those fears by going on the route with him. "He made me feel good and safe again," Hrico said. "And that’s a 14-year-old kid doing that, helping me to get my courage back. "He was simply the most honorable man I’ve ever met in my life." Hrico now lives in Los Angeles. But his mother, Mary Ellen, and sister, Melanie, were among the more than dozen people at the Vazquez home this afternoon. In tears, Melanie said Omar Vazquez was like another older brother, and he would sometimes protect her if her brother George was picking on her. The U.S. Army released a statement Friday about the death of two U.S. service members in southern Iraq on Friday. But as of tonight, it had not divulged the names of the soldiers. Marisel Vasquez said the family had been notified of the soldier’s passing on Friday. She said his body is expected to arrive at Dover Air Force Base in Delaware early Monday morning. Funeral arrangements are pending. The deaths of Vazquez and another U.S. soldier occurred on the same day U.S. Admiral Michael Mullen said that Iraq had "weeks" to determine if it needs U.S. troops to stay beyond the established year-end deadline. A security agreement between Iraq and the U.S. currently requires that the less than 50,000 remaining U.S. troops be withdrawn by the end of 2011. George Hrico said Vazquez’s goal after serving was to combine the love of his country, understanding of foreign cultures and knowledge of their histories to try to "respectfully change the minds of fundamentalists who have anti-American sentiments." "He was one of the few people in this world who was always an optimist and seeing a better tomorrow," Hrico said. "With him being gone today, the world got a little bit darker." Times of Trenton staff reporter Carmen Cusido contributed to this report.